Photographer Daniel Tink and writer Stephen Browning recently had the great good fortune to set out all over Norfolk for a new book, ‘Norfolk – Exploring the Land of Wide Skies’ in the Halsgrove Discover series. They thought it would be nice to select their top 5 favourite places to visit in Norfolk to help plant some new ideas for discovering the best that Norfolk has to offer. However they found the task very hard indeed – there are just so many beautiful and historic places to visit within easy reach of Norwich. Thus this is given as just ‘A’ perfect five and is in no way an attempt to be definitive as every reader will no doubt have their own ideas of the best of Norfolk’s magical spots. We’d love to hear from you in our comments section at the bottom of this page. Quite a few places on the North Norfolk Coast received a huge boost from being ‘discovered’ in the 19th century: Hunstanton ( pronounced ‘Hunstan’ just to catch out unsuspecting visitors) goes one step further as it was actually built from scratch at this time. True, there had been an ‘old’ Hunstanton since at least AD 500: Edmund, son of the King of Saxony, is said to have landed here at the age of 14 in 855 before being crowned King of East Anglia the following year. Subsequently defeated and taken prisoner by the invading Vikings, he was offered his life provided he gave up Christianity. He refused and was executed, later becoming the first patron saint of England. It was in 1846, however, that Henry Styleman Le Strange persuaded a wealthy group of investors to build a ‘new’ Hunstanton a little way along the cliffs, together with a railway to Kings Lynn. First, a lonely Royal Hotel was built but thereafter a whole town in shades of golden ‘Honeystone’. It was and is beautiful, and the whole project a fantastic success. And what a place to build a new resort! From the top of the town, the green slopes towards the massive Norfolk ocean over which the sun sets in spectacular fashion – Hunstanton is rare in facing west and the sun actually sets over the sea. For up to five or six hours a silver and golden, at times also pink and red, even greenish, ‘roadway’ – some locals call it the ‘pathway to heaven’ – stretches to infinity over the waves. When the tide recedes and it is peaceful, scores of seals bask on the sandbanks. If there is a reasonable wind, there is no better place for windsurfing. Yet, when a gale blows and the sea roars, it is best to take cover – the pier was completely swept away in 1978. King John is reputed to have lost the Crown Jewels somewhere in the Wash due to a storm of unprecedented ferocity, so somewhere out there may be riches beyond imagination – though some historians think this may have been an early insurance scam, King John having secured the jewels somewhere else … Again, legend has it that when St Felix was sailing in the Wash on his way to bring Christianity to East Anglia in 630 AD, his boat became tossed in a storm. The resident beavers came to his rescue and, in gratitude, he granted the chief beaver Episcopal status before landing at nearby Babingley: this is why the first Bishop of Norfolk is reputed to have been a beaver. It is hardly surprising that PG Woodhouse found much inspiration here as have other writers. One of the most celebrated novelists associated with Hunstan is L.P. Hartley. In 1944 he published The Shrimp and the Anemone which drew upon his childhood experiences playing among the rock pools below the famous cliffs. His most famous work, however, is probably ‘The Go-Between’ which has been made into a classic film starring Julie Christie and Alan Bates. Things to do at Hunstanton: You can walk along the top of the cliffs past St Edmunds Church and the lighthouse or along the beach which is better to see the red chalk limestone and white chalk layers, as well as enjoying the fresh water pools and tiny crabs all around you. The Wash as a whole is famous for shrimps, cockles and mussels. Bird watching at Hunstanton: This area is also a favourite spot for migrating geese, ducks and wading birds. A recent report suggests that two million birds – I wonder how they count them? ‘…39, 40,41, stay still will you, you swirling roost! Oh, I’ve lost count again!’ – use the area for roosting and feeding: some are partial to shellfish. There are also Curlews, Redshanks, Lapwings and Grey and Golden Plovers to name but some – a visual feast for the bird-lover. Cley is not ‘next the Sea’ at all and has not been for several hundred years, but it once was a very important English port, trading with the Low Countries in agricultural products, fish, coal and cloth. Eating at Cley next the Sea: Cley is famous for smoked herrings, salmon and other delights which are prepared in the village. There are many fine restaurants along the coast serving local produce. Bird watching at Cley next the Sea: Cley next the Sea is a bird watching site of international importance, all the year round. Here you can see Grey Plovers, Black-tailed Godwits, Spoonbills and several types of Waders. Walks at Cley next the Sea: Cley is a walkers’ paradise, from the unambitious to the most determined. In 1901, recovering from enteric fever, Arthur Conan Doyle came to Cromer to recuperate and was told of the legend of Black Shuck, a gigantic hound with eyes that glowed like coals and rumoured to be partial to the throats of local folk who ventured outside after dark. Transferring the action to the chilling loneliness of Dartmoor, possibly the greatest of the Sherlock Holmes adventures was born: The Hound of the Baskervilles was published to universal acclaim a year later. Cromer is a pretty town with fine shops, museums and restaurants – ideal for an interesting break. One cannot help but see and feel, though, the almost seismic shift that took place in this hitherto gentle settlement of fishermen – called Shipden, the original village now under the sea some small way beyond the Pier – in the 19th century. It suddenly got ‘discovered’: the railways came in 1877, as did the future King Edward VII and writers such as Elizabeth Gaskell wrote about the healthy air. ‘Healthy air’ to the Brits at this time meant cold, salty and hopefully stingy – enough at least to go home and feel good about having a sumptuous meal in the warm. One of the places you could have this was in the Hotel de Paris, originally built as the holiday home of Lord Suffield and converted into a hotel in 1830. For dramatic impact, standing as it does on the top of the cliffs overlooking the wildest sea in the world with the biggest sunsets, it knocks spots off Edward Boardman’s Royal Hotel in the county town of Norwich, a rival for well-heeled gentry. Oscar Wilde wrote ‘A Woman of No Importance’ here in 1902. One of the town’s most illustrious sons is Coxswain Henry George Blogg who served on the Cromer lifeboat for 53 years. During this time, the lifeboat saved 873 people and Henry Blogg was awarded an incredible 3 Gold and four Silver Medals, as well as the George Cross and the British Empire medal. He died in 1954. He is, naturally, omnipresent in the town. Eating in Cromer: No doubt, when he was here, Sir Arthur relished the food for which Cromer is now famous – the Cromer Crab. According to the local fishermen, the crab tastes better than any other because the seabeds it feeds from are rich with food. Things to do in Cromer: If you like to walk, there are no-end of choices. Taking a walk on the Pier is possibly the gentlest option. There has been a pier or jetty here since the end of the 14th century. Also easy is a walk along the prom and back. For a slightly more energetic walk, it is lovely to walk the couple of miles to Overstrand along the beach, admiring the cliffs and checking out the rockpools, but do be careful to check the tide times at the Information Bureau beforehand. This is, of course, the entry point to Poppyland, so many delights await the walker or cyclist a little farther inland. Don’t do what The Reverend Benjamin J Armstrong did on April 25th 1878 and take your guests out for a sightseeing stroll when the easterly wind is at its height or you will find them ‘filled with grievances’ (A Norfolk Diary, George G. Harrap and Co Ltd, 1849). This royal estate was bought in 1861 for the Prince of Wales by his mother, Queen Victoria. The church of St Mary Magdalene is the home church of Her Majesty Queen Elizabeth II and other members of the Royal Family. To see at Sandringham: The House – most of the ground floor rooms used by the Royal Family are open to the public. Walks at Sandringham: There are sixty acres of utterly gorgeous gardens to explore, as beautiful in Autumn as in Spring and Summer. You will never see more fabulous rhododendrons in hues of magenta, lemon, snowy white, pink and lavender. As the photographer for this article, I thought it would be nice to write a few words on a place that holds many special memories for me from my childhood summer holidays. The Runtons, East and West, are quaint villages on the North Norfolk Coast between Cromer and Sheringham. A common scenario that makes me smile is watching families pack onto the hard sands that appear when the tide is out, to then have to dash back to the drier but stonier sands when the inevitable happens. Most will make it, but some only realise at the last minute and end up taking home slightly salty and damp possessions. The more sensible – and no doubt West Runton regulars – will have sourced the best sandy positions safe from the tide earlier in the day. During low tide, the sea will slowly reveal a hidden landscape that starts with exposure of a few rock pools and extends into crabbing heaven for some – brave beginners beware of sharp pinchers! On an exceptionally low scouring tide you are treated to an ancient foreshore of chalk, clay and rock formations. On closer inspection you will find an abundance of sea creatures, both live and fossilised dating back to Jurassic and Cretaceous periods – Belemnites are a common find -these are shaped like a bullet . Fossils can also be found in exposed areas of the cliff known as the Cromer Forest Bed which dates back some 500,000-700,000 years. Indeed, it was the discovery of a very special find in the early 1990’s that put West Runton high on the geological map. After a particularly stormy winter night, fossilised remains of a large pelvic bone were discovered. Over the next few years as more bones were uncovered it became clear that a major find may be on the cards. An excavation soon revealed the largest and most complete elephant skeleton to date. Now known famously as the ‘West Runton Elephant’ the species was a ten ton Steppe Mammoth that dated back some 700,000 years. The popularity of the Runtons has grown over the years and it’s easy to see why – safe and fun family beaches, pretty villages and a convenient place to stay whilst exploring the North Norfolk coast; whilst for me, as a landscape photographer, there is nowhere more beautiful. 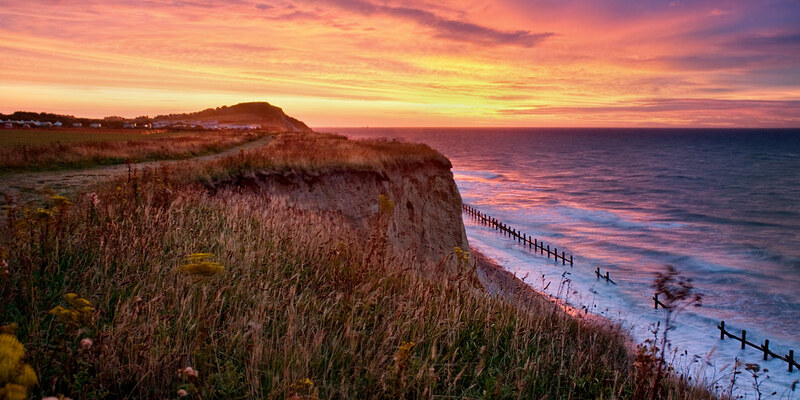 Walks at West Runton: Walk to Sheringham along the cliff top, pausing for a time at the top of Beeston Bump for a welcome rest with some stunning views of West Runton and Sheringham – particularly special at sunset. Alternatively walk the other direction to East Runton and eventually Cromer – approximately 2 miles. On the beach, try crabbing in the rock pools or hunt for fossils. If you have a sweet tooth I can highly recommend the flapjack from the Beach Café. Further details of Norwich life and history are available in the book ‘Norfolk – Exploring the Land of Wide Skies’ by Daniel Tink and Stephen Browning. It is available from Halsgrove at £16.99 and is on sale in all good bookshops and Amazon.